Tag line: "A New Plague on Earth Will Come from the Stars!" 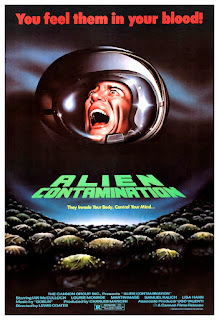 Along with the obvious influence of Ridley Scott’s Alien (eggs from outer space that cause people to explode), the 1980 Italian Sci Fi / Horror flick Alien Contamination also “borrows” a little from Lucio Fulci’s Zombie, which was released a year earlier (aside from the casting of Ian McCullough, the film opens with a deserted ship sailing into New York harbor, almost identical to the first scene in Fulci’s classic). But, hey, if you’re gonna rip off another movie (or in this case, two), why not steal from the best? A seemingly abandoned South American freighter has just drifted into New York Harbor. Police Lt. Tony Aris (Marino Mase) and his men are sent in to investigate, and find the ship’s crew dead, their bodies torn apart. Along with this grisly discovery, they also stumble upon hundreds of green, oversized eggs, which, when they burst, emit an acid-like substance that causes anyone it comes into contact with to explode. Due to the dangerous nature of these eggs, the military, under the command of Col. Stella Holmes (Louise Marleau), takes control of the investigation, and soon arrives at the conclusion these eggs are not of this world, and may have traveled to earth by way of a recent mission to Mars. In fact, an astronaut from that mission, Col. Hubbard (Ian McCulloch), reported seeing thousands of similar-type eggs on the planet’s surface. To look into the matter more thoroughly, Holmes, Aris and Hubbard head for South America, and, once there, find a whole lot more than they bargained for. Alien Contamination gets off to an awesome start. Shortly after the ship arrives in New York Harbor, Lt. Aris, Dr. Turner (Carlo Monni) and a few others slowly make their way through the empty vessel. Behind a closed door, they find the scarred and decaying body of the captain, the first of several corpses they’ll uncover. But it isn’t until the group finds the eggs that the real gore kicks in (one of Lt. Aris’ men even loses a portion of his intestines when one sprays him with the deadly liquid). The early mix of mystery (trying to determine what the eggs are, and who was planning to take possession of them in America) and gore proves a winning combination, and, as a result, the 1st half of Alien Contamination is a rollicking good time. It’s when the action shifts to South America that the picture begins to wane. What had, up to that point, been a well-paced sci-fi tale quickly devolves into a drawn-out investigation (and a rather boring one at that). Alien Contamination definitely drags in these later scenes, leading to a mundane (and unintentionally hilarious) conclusion. 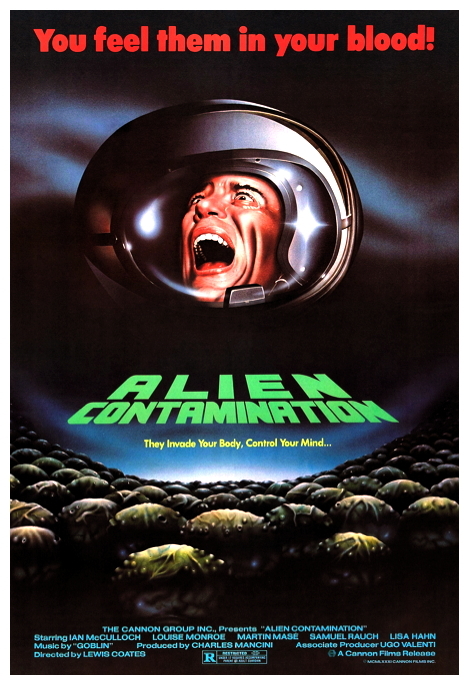 So, the best that can be said about Alien Contamination is its one-half of a good film, which I suppose makes it better than some. But it could have been more.